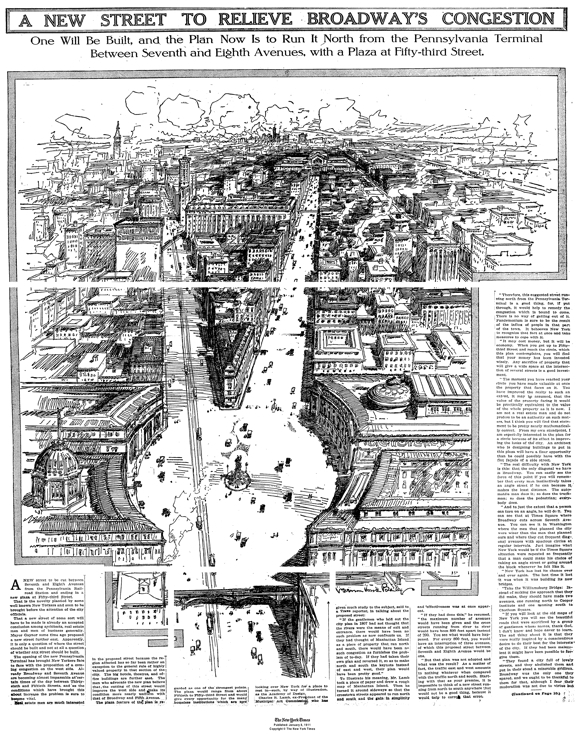 In recently doing some research on the historical traffic problems at Times Square, I came across the article above in the New York Times, circa 1911, which described the call of one Charles R. Lamb (formerly of the Municipal Art Society) to have another diagonal boulevard built in Manhattan, originating at 34th street — apparently in a massive, terrifying traffic circle — and running up to a plaza at 53rd Street. “The real difficulty with New York is this: that the only diagonal we have is Broadway. You can easily see the force of this point if you will remember that every man instinctively takes an angle street if he can because it makes the least distance. The automobile man does it: so does the truck-man; so does the pedestrian; everybody does. This entry was posted on Wednesday, August 5th, 2009 at 6:41 am	and is filed under Cities, Roads, Traffic Engineering, Traffic History, Uncategorized. You can follow any responses to this entry through the RSS 2.0 feed. Both comments and pings are currently closed.